Southampton vs. Chelsea : 5 January 2013. At last, a relatively short away day trip. Southampton is only 55 miles away from base camp. My Saturday was all planned. I had two appointments in Frome in the morning (a hair cut at 9am and an eye test at 9.40am) and then an appointment in Southampton in the afternoon (a sanity check at 3pm). That my sanity would remain intact and unscathed from the rigorous trial that Chelsea Football Club would enforce upon it was open to debate. The weather was incredibly mild, but overcast. I set off from Frome at 11.30am and – for one of the few times for a Chelsea away game – pointed my car south-east. The boys from London were already nearing Southampton, having set off by train an hour or so before. The “meet” was at a pub called “The Giddy Bridge.” As always I hit some traffic in the cathedral city of Salisbury, but I wasn’t worried. I was just happy to be visiting a stadium that I hadn’t frequented since April 2005, when a win even convinced the most cynical of Chelsea supporters to start singing about “winning the league.” I have very happy memories of that game. We were on the march to our first league title in fifty years and our mood was stratospheric. As I drove out of Salisbury on the A36, I climbed Pepperbox Hill just as a group of country folk were walking through some woods, dressed in tweed and flat caps, Barbour jackets and plus-fours, with gun dogs barking at their feet. They were out on a shoot. Barbour jackets are a current brand which is favoured by football fanciers these days; the quilted variety, rather than the original waxed jackets which were de-rigueur for a brief period on the terraces in the mid-‘eighties. No doubt I would see a few later in the day. Although Southampton is relatively close to my home town, I have been a relatively infrequent visitor over the years. I have a very vague notion of being in Southampton, maybe when I was around three or four, when the QE2 was berthed. It must be one of my earliest memories; being on the quay alongside the enormous bulk of that famous cruise ship. My next visit was in 1981. Yes, it was football-related; though, surprisingly perhaps, not Chelsea-related. In 1980, Southampton – a middling First Division team – signed the England captain Kevin Keegan from Hamburg in the biggest transfer coup for ages. I was particularly upset at this because Chelsea had been linked with his signature; even though we were a struggling Second Division team. Keegan has become a much derided figure since his managerial days with various teams, but in 1980 Keegan was England’s biggest name and the ‘seventies biggest football superstar. In 1980-1981, he was scoring goals for fun for his new team while Chelsea was faring less well. I saw us play Newcastle at home (won 6-0) and Bristol Rovers away (lost 1-0) in 1980-1981. However, these games were augmented by a visit down to Southampton’s old stadium, The Dell, in April to see Keegan play for the Saints against reigning European Champions Nottingham Forest. My father was a shopkeeper – menswear, but no Barbour jackets – and one of his regular customers was a Southampton season-ticket holder. He had mentioned I was a bit of a Keegan fan and some tickets found their way into Dad’s hands. It wasn’t Chelsea, but it was good enough. What a let-down. It was a reserve team. I think the only players who would go on to play for the first team was Rueben Agboola and one of the Wallace brothers. Ironically, Southampton and Chelsea played each other at The Dell in the third round of the FA Cup in 1981 – like this year – too. We lost 3-1. For the Nottingham Forest game, we watched from the bench seats along the east-stand side of the ridiculously compact Dell. Southampton won 2-0. I enjoyed it – of course – but it felt odd to be at a game which didn’t involve Chelsea. It was the same day that Aldaniti won the Grand National with former cancer victim Bob Champion the triumphant jockey. Weird how I can remember sporting stories from 31 years ago, eh? I guess it just highlights how important those first ten, twenty, thirty games were. Every game counted. Every memory was etched in stone. I did note, though, that the Southampton fans seemed less partisan – less rabid – than my experiences at Stamford Bridge. Or perhaps I was biased. Strangely enough, I didn’t get to visit The Dell with Chelsea until 1994. Our allocation was always small at The Dell which meant I wasn’t often in a position to apply for tickets. For some reason, fate always seemed to contrive against me. Games at The Dell either took place while I was at college in Stoke, on Boxing Day when transport was difficult or – to be blunt – when I was hard up for cash. Outside of that QE2 visit in around 1968 and an Everything But The Girl gig in 1999, I’ve only ever visited Southampton for football. With Southampton in my sights, I drove on, right on the eastern edge of the New Forest, and stopped off for my second McCoffee of the trip. Forget beer and football, it is caffeine and football for me these days. I headed into Southampton on the dual carriageway, right past thousands of containers waiting to be shipped-out from one of England’s busiest ports. A huge cruise ship was nearby too. Just over 100 years ago, The Titanic set off from Southampton Water and was never to return. I was parked up near the train station at 1.15pm and soon received a text from Alan to say that they were now drinking in “The Standing Order.” Southampton was heavily bombed during WW2 and the shopping centre of the town is rather bland due to the abundance of ‘fifties concrete rather than medieval stone and Victorian brick. I had a jacket on – a new quilted Henri Lloyd – and the mild weather meant that I was sweating like a Scouser in court by the time I reached the pub. Outside “Yates” there was a gaggle of policemen observing Chelsea singing inside the packed interior. We had 4,500 tickets for this and were out in force. In the cavernous pub – a “Wetherspoons” – I eventually located the chaps, although the boozer was full of familiar Chelsea characters. Home fans, kitted out in a variety of old and new Southampton shirts, were drinking in the pub too, but there wasn’t any hint of trouble. Our visits in the ‘eighties were never so peaceful. I knocked back a solitary pint and spoke to Simon about the ailments of Fernando Torres. Some lads had been there since 9.30am and were showing the signs of it too. It was soon time to make a move. Just outside the pub, we heard that Demba Ba was in the team. There was a little buzz of excitement. The Southampton fan took it well. We walked north through a strange hinterland of new apartments and then industrial units with the grey roof supports of St. Mary’s beckoning us ever closer. The railway line was to the west with cranes and gasometers to the east and north. It was a typical twenty-first century football setting; away from dense residential areas, but not on the edge of cities. Instead, the stadium was used to infill a previously derelict part of town. It was neither here nor there. Outside the main stand, there was a statue of Ted Bates, the former manager from the ‘sixties and ‘seventies. With typical Chelsea timing, I arrived at my seat just as the teams were entering the pitch. Wait a moment; why were Southampton wearing an all-white kit? That was just silly. To be honest, I don’t like the fact that they jettisoned their traditional red and white stripes this season for a 1981-1982 Liverpool kit of all red and thin pinstripes. Maybe in 2013, they are thinking outside the box; the red and white stripes will turn into all red for one match, all white for the other. Southampton in all white, Chelsea in all blue. Game on. In truth, we took a while to warm up. The first twenty minutes was dominated by cagey approach play on the pitch and a cacophonous noise from the travelling blue army in the Northam Stand. We stood the entire game. The mood among the away support was boisterous and upbeat, but there was no real improvement on the performance against QPR. The grey skies overhead suggested an afternoon of grim attrition. Then, we were caught sleeping and a superb pass by Jason Puncheon dissected our centre-halves and allowed Jay Rodriguez to strike, rolling the ball past Ross Turnbull. The home fans cheered and sections of our support grew even more boisterous. Insults were exchanged. The Chelsea fans sang the “Pompey Chimes” to rile the home fans. Then it was their turn. We began to get into the game. Eden Hazard advanced and curled a shot low just past the far post. On 34 minutes, our equaliser came. Nice play from Moses and Hazard down our left…I brought the camera up to my eyes…click, click, click…just in time to capture Mata’s flick being bundled over the line by a Southampton defender and / or Demba Ba. Ba’s celebrations were rather muted and I wondered if he had indeed got the final touch. I immediately thought of the difference between Ba and Torres’ start for the club. The game was opening up now, but Southampton seemed a little toothless in attack. I was surprised that Ricky Lambert wasn’t playing. On the stroke of half-time, a lovely finish from Victor Moses gave us a 2-1 lead. The ball was perfectly drilled into the far corner. He celebrated with several summersaults. The Chelsea crowd were in good form and the singing increased. More drinking took place at half-time in the ridiculously crowded concourse below the seats. Throughout the first-half, I had watched Rafa Benitez pacing the technical area, cajoling the players and trying his best to communicate with them. I was still struggling to feel one iota of warmth towards him. My sanity check was now in progress. I was stood next to a Chelsea fan – name unknown – who I have spotted going to Chelsea since the mid-‘eighties…I remember him rabbiting away on a tube after a game at Chelsea…just one of those characters you don’t forget. Anyway, we chatted away. Soon into the second-half, a perfect Juan Mata cross was headed in by Branislav Ivanovic. Down to my right, a Chelsea fan set off a couple of blue flares and the Southampton fans were well and truly mocked. To be truthful, the 300 or so locals in the corner section next to us were the only ones in the crowd who were up for a song. The rest of the 22,000 or so Saints fans were totally docile. Maybe I was right in 1981. It was all Chelsea now, both on and off the pitch. A little group of semi-familiar Chelsea lads to my left kept singing a song in honour of Juan Mata, but I couldn’t quite discern the tune. Fair play to them; despite nobody joining in, they kept going. In the end, it came to me. “Rhythm Is A Dancer” by Snap, a dance anthem from 1992. “You can play him everywhere. After a quiet start, Demba Ba began to impress me with his link-up play and close control. On the hour, we scored our fourth with a fine move. Ramires found Hazard who picked out a perfect run in to space by Ba. An exquisite touch and the Chelsea crowd exploded. I watched as Ba was mobbed by his team mates. He blew a kiss to us. 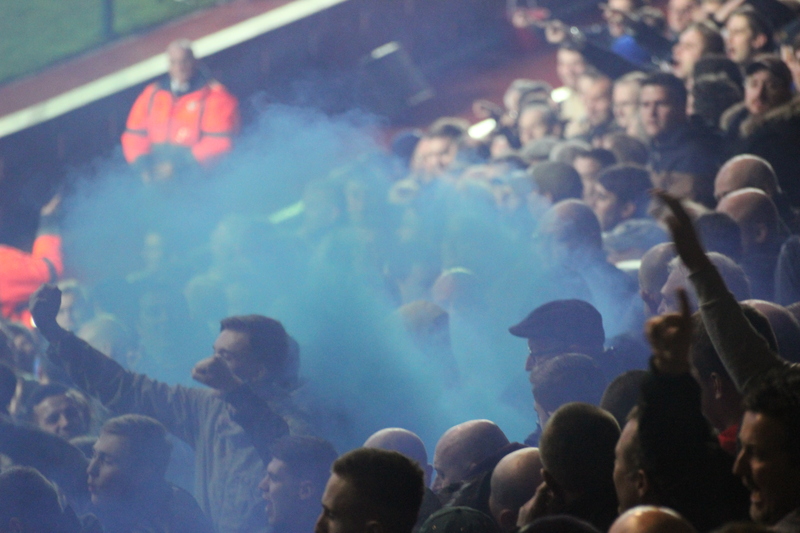 Amidst the noise and adulation, more blue haze from around five more smoke bombs. Then a thunderclap. Just like a proper football match. Benitez brought on Lamps for Ivanovic, with Luiz dropping back into the defence. A perfect Moses cross was met by Ba…click…but the Saints ‘keeper miraculously blocked the goal bound header. Turnbull saved twice at the other end. Marin replaced the impressive Moses. Two songs for two heroes rang out in the closing quarter. And Chelsea won – as we all knew they would. I half-expected the Saints fans to applaud us in lieu of Ossie’s spell at The Dell, but there was nothing. Of course. I steadied myself as Frank approached the ball. Frank ran to celebrate with the Chelsea fans…click, click, click, click, click. With this, the home fans began to leave. At the final whistle, the Chelsea players and supporters were one. As it should be. The police and stewards shepherded the singing Chelsea hordes out of the stadium and I raced back to the car. I overheard a conversation between a father and young son, both Southampton supporters, as I overtook them. Bless him. He reminded me of me, aged nine, trying to evaluate yet another Chelsea capitulation. At 5.30pm, I threw my jacket in the back seat, turned the ignition on, wound down the windows and pulled away. The winter air chilled me, but it was a welcome relief. It was superb in fact. I just about beat the traffic and would be home by 7pm. For a change, I was listening to some classical music on the CD. I accelerated away, over the railway bridge, the city’s lights in my rear view mirror. There is nothing better than driving away from an away game, a Chelsea win under our belts, enjoying the moment. In and out of the traffic. This entry was posted in Season 2012-2013. and tagged 1980-1981, 2012-2013, Demba Ba, FA Cup, Kevin Keegan, Rafa Benitez, Songs, Southampton by Chris Axon. Bookmark the permalink.